Members and supporters of the St Vincent de Paul Society invite you to join us when we take part in the Palm Sunday rallies across Australia on Sunday March 25. Each year, tens of thousands of people march in cities and towns across the country to highlight the injustices experienced by asylum seekers and refugees under current government policy. We hope this year’s rallies will build on that momentum. A large and vibrant turn out for Palm Sunday 2018 will send a clear message that Australia must adopt an alternative approach to those fleeing persecution and war – an approach based on fairness, compassion and respect. Find the nearest event and turn up on the day. See a list of event details below. Share the link to this page on social media or email it to your family and friends. Learn more about current issues affecting asylum seekers and refugees. 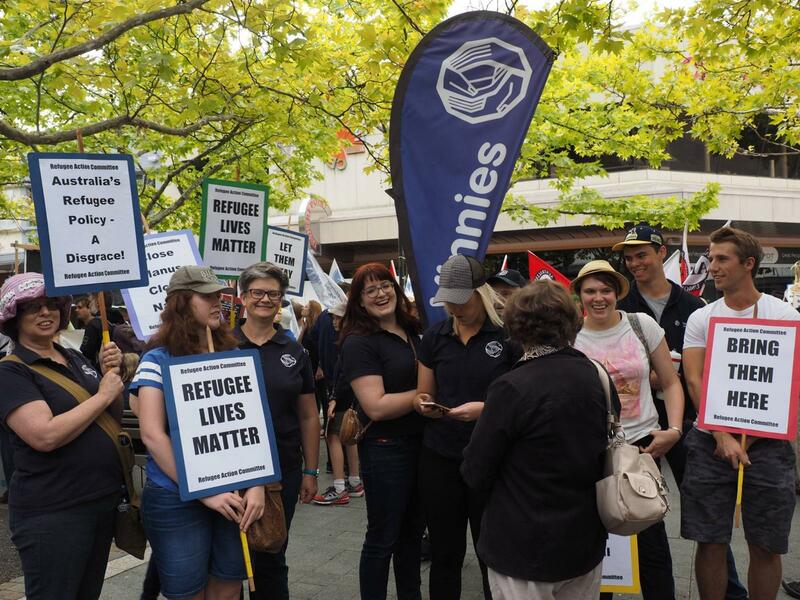 Why join the Palm Sunday Walk for Justice for Refugees? The Society is deeply troubled by the ongoing injustices experienced by those seeking asylum in Australia, including the intolerable conditions that refugees on Nauru and Manus Island continue to endure; the 30,000 refugees and asylum seekers who live in limbo in the Australian community on bridging visas or other temporary visas; and the increasingly vitriolic attacks on refugees and migrants both in Australia and abroad. After nearly five years of fear, violence and limbo, up to 1800 people - including 150 children - are still languishing in desperate and dangerous conditions across Manus and Nauru. For asylum seekers living in the Australian community, life continues to be tough as people are denied access to essential services and long-term security. Recent changes to the Status Resolution Support Services (SRSS) program risk pushing people seeking asylum into deeper poverty and hardship due to a loss of basic financial support. Against this backdrop, it is as important as ever that we gather and express solidarity alongside those who have fled persecution or conflict but continue to experience injustice. Visit the Catholic Alliance for People Seeking Asylum (CAPSA) website.